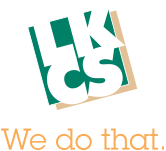 Grow your brand with great service from LKCS! What do customers say about service at your place of business, the ease of using your website, or the efficiency of your company? Growing a great brand means growing a great customer experience. If you provide great products and services, your reputation, your name, and your brand will be synonymous with quality. Offset and digital printing of brochures, direct mail campaigns, individualized variable data printing, wide format posters, signs, and displays all which provide your customers and potential customers with the information they need to know. Responsive website design with well thought out navigation and custom use of your logo, colors, and branding. Plus, our Web Tool Suite enables you to easily update your website with new information. Social media management increases awareness of your business and promotional events and gives you a day-to-day channel to talk with your customers. Custom logoed products increase brand recognition and have a long-lasting effect since many people keep promotional products for months or even years. From shirts with your company logo, to free calendars and thank you giveaways, logoed products can be an extremely valuable form of marketing. So let me wrap this up. Your customers need information about your products and services. They need quick, convenient, and reliable online access to your company. They need communication with you on social media because that is where they are every day. And you need one company to help you do all this, within your budget… plus grow your brand and reinforce your branding within your community – We do that.